Slow progress but something's better than nothing right? I was browsing Craigslist yesterday and stumbled across an NP205 out of an old Dodge. It has the passenger side drop, the strength to handle a V10, and it should bolt up to a NV4500 with an adapter. I didn't think I would actually see one of these pop up locally. I guess patience pays off. Such a great build...love the V10...the Superbird poster on the wall is a great touch!! Another large step for the build! I got a hold of a parts truck this weekend. It's a 98 Ram 2500 with the V10, NV4500 manual trans, and is 4x4! Now I've got all I need to get started on this project. I can't wait to finish moving. Then I can get going. Ok, long time no post. I've had an eventful past few months. The biggest thing being that I bought a house. that and the move took up a considerable amount of my time. But now that I've got the house and garage where I'm comfortable with it, the project can resume! I've got the 2500 in the garage and I've started to strip it for parts. I'm only getting an hour in here and there since work has been crazy busy and I'm trying to soak up the last drops of summer on the lakes. Hopefully in the net few weeks, I can get the truck stripped and on it's way. Alright, here's the update from last weekend. My dad came over and we were able to get the NV4500 out of the dodge. I didn't expect how tall the trans would be on the trans jack. we couldn't get it out from under the truck without lifting the rear end quite a bit. It was kind of funny actually. Afterwards, I pulled the dodge back out in the driveway just to hold onto it for parts and reference. The next steps are to clean up the 4500 and to start ordering parts for the Dana 300 to rebuild it and adapt it to the NV4500. I also need to put a driveline brake on it since that's what the 715 currently has. The trans under the truck, we needed to lift it a bit to get the shifter to pass under the frame. here it is all separated and ready for cleanup. The paint pen on the top reminded me that the prior owner had had it serviced just before I bought the truck off of him. time to throw the book at it! Alright, so I'm making progress! The case is almost 100% apart. I need to get my adapter so I know if I need to machine the tcase to make it work. I think I do from what I've read on Advance Adapters' page. 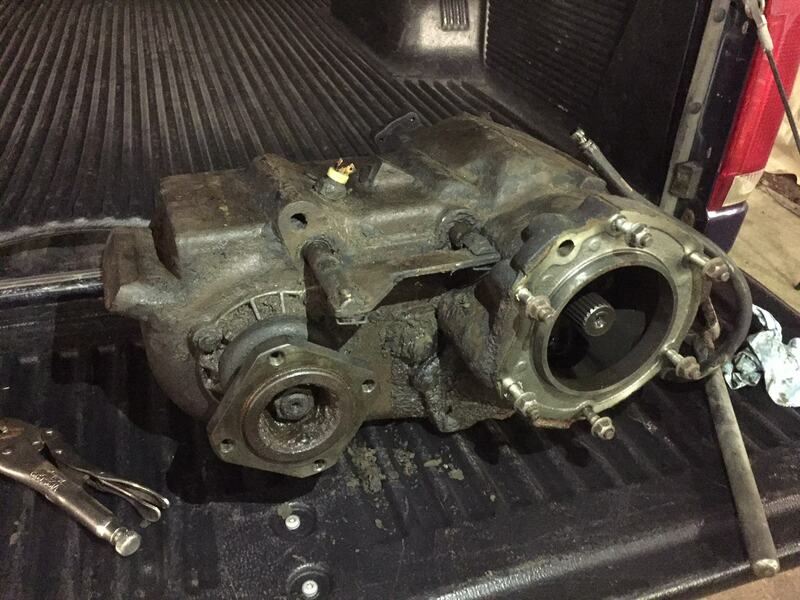 So I'll send the case out for cleaning and machining, rebuild it with the adapter, add driveline brake, and it should be good to go at that point. Ok, I made some more progress this week. I was able to get the NP205 fully disassembled and I ordered the adapter kit to make it fit the NV4500 trans. So while I'm waiting on parts, I decided to really start to tear into the truck itself. I've gotten everything out and apart to enable me to remove the drivetrain once I can get a friend to help me out. I was able to drop the NP 203 on my own though. Next steps are to remove the front clip, remove the shift lever (I can't figure this one out), unbolt the engine and trans from the frame, then pop it all out. Should be cool! I'm getting that much closer! The NP205 all torn down. ready for new seals, parts, and a solid clean and machine. I got the NP203 out of the truck. I swear the thing weighs as much as I do! the view from above the T98. I need some giant channel-locks or something to get the shifter out. Also, the tcase linkage is a PITA to remove. the truck reminds me again why I've nicknamed this project "Wasp". Is there nowhere these guys will build a nest? front all prepped for removal. All the wires have been removed as well as the radiator. the 230 now just waiting to be yoinked from the engine bay.